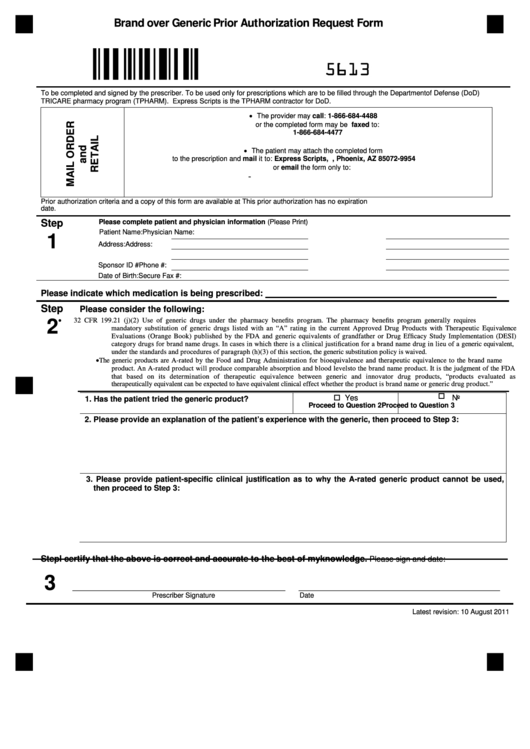 Download a blank fillable Form 5613 - Brand Over Generic Prior Authorization Request Form (Prescriptions Filled Through The Department Of Defense) in PDF format just by clicking the "DOWNLOAD PDF" button. Complete Form 5613 - Brand Over Generic Prior Authorization Request Form (Prescriptions Filled Through The Department Of Defense) with your personal data - all interactive fields are highlighted in places where you should type, access drop-down lists or select multiple-choice options. TRICARE pharmacy program (TPHARM). Express Scripts is the TPHARM contractor for DoD. under the standards and procedures of paragraph (h)(3) of this section, the generic substitution policy is waived. 1. Has the patient tried the generic product? I certify that the above is correct and accurate to the best of my knowledge.